Yes, it is possible for you to participate in this fast, however you will need to be quite intentional with your eating plan. You can get plenty of protein in nuts and peanut butter, Whole grains, legumes and leafy green vegetables, you may also consider adding in a ‘smoothie’ meal with blended fruits and vegetables, and a handful of oats (with unsweetened, chemical free soy protein powder). Depending on how rigorous your exercise is, you may need to consider modifying the fast to match your routine by adding some fish and chicken. Also, if a time line is an issue, consider modifying the length of your fast. I hope this helps! Can I do the Daniel’s Fast even if I’m an athlete? I’m not an actual athlete but I have an intense 2 month workout plan coming up from August to October and I do enjoy biking, swimming and running regularly. In addiontion to a few changes in my diet I’ll also be taking a multi vitamin pack ONLY during this workout wich is 45 minutes a day. Let me be clear, I weigh 102 pounds and I’m not doing the workout plan to loose weigh. I’m doing it for conditioning. And I’m in a bit of a jam, and on a bit of a dateline, because on Oct 21 of this year I’ll be attending my last women’s conference of 2011 and I’d like to be finished with the Daniel fast by then. So I hope you can see why I’m so concerned. Is it possible for me to do this fast? And more importantly, safe? I plan on doing the Daniel Fast during lent this year. Lucky for me, lent starts late this year because I am going to need the time between now and then to get ready. I will need to ween myself off coffee and diet coke. And I am the typical European meat and potatos girl. This will definately be a challenge for me, but I believe with God’s help, I will be able to do this. I hope and pray that I will be able to hear Gods voice leading me. I feel so lost and don’t know which way to turn. I am unhappy at my job, am dating a guy that I’m not sure I should be dating and am struggling with other family issues. The Daniel Fast doesn’t really have specific restrictions as to when or how much one can eat. So I encourage people to keep in mind that we are fasting, even though we can eat a lovely variety of fruits, vegetables and whole grains. With that I suggest no more than three moderate meals and two small snacks each day. I hope this helps! Be blessed as you continue to grow in the love and knowledge of Jesus Christ. Also, know that when we draw near to God He draws near to us. I came across this website after I had prayed for wisdom in my fast. I am currently doing the Daniel fast for 21 days. I am almost complete, however I feel I should continue the Daniel fast for Lent, which starts in 2 days. So Easter Sunday will be the end of my fast. I feel this is the right thing to do. I really don’t know how much we cane at on the Daniel fast. Is there a restriction? At the beginning of my fast I ate about 2 meals a day, but then it got lesser. I am thinking of increasing the portions I eat, and be a bit more generous in my choice of fruit and vegetables (so far, i have mostly been eating the same veg and fruit, and only small amounts). What do you advise? Please, may you tell me how much are we allowed to eat? I don’t understand portions.Also, I thought breads aren’t allowed, but I see a bread recipe on your website. Please would you pray for me to recieve a deeper relationship with our Heavenly Father and Lord Jesus Christ. I started this fast because I really felt God’s precious forgiveness and now struggle to understand what I need to do to carry out His Precious will. You should continue all medications during your Daniel Fast. Also, I do encourage everyone under medical care to contact their physician if the Daniel Fast is a major departure from your normal diet. Thanks for your great comments. I do encourage you to focus your fast on one or two specific purposes so you can search the scriptures to find God’s ways concerning the needs for which you are contending. Declare the goodness and promises of the Lord over these matters, pray about them and seek God’s intervention. Blessings to all…I also was encouraged to try the ‘Daniel Diet” after seeing a segment on Bet with Mary Mary. I will start my 21 fast on July 1st. I’m believing for a miracle in my family’s health,finances,deliverance of strong-holds; clear direction,salvation,restoration of marriage for family,friends & associations. And although I know it does not take my Lord 21 days to work any of my concerns, this fast is also for me personally-God will do a work in me. I’m ready, I know Jesus spoke to me through Mary Mary today, and again from me finding this website tonight and writing you. I encourage all who has desired a deeper relationship with our Lord through this fast, and please pray my strength in the Lord. When you complete the fast, it’s important to be careful of the foods you consume. You will want to take it easy as you add sweets, caffeine, meat, dairy and heavy foods to your diet. Use in small portions and reintroduce them to you system carefully. Also, continue to drink lots of water and you should be fine. Hello, I’m starting my fast on Monday, I brought Pastor Franklin’s book(21 day fast journal) last month,and I’m finally about to start. I’m pray that I hear from God daily,and get a closer relationship with him. I know that the enemy is going to fight against it, but I pray that God gives me the strenth to endure it. I thank God for this website,it was so helpful. May God continue to bless everyone thats doing the fast. Mrs Susan keep the good work up, you will be rewarded!!!! I am so thankful for finding this website. I have done a one day, only water fast twice in the past; but this is my first time doing the Daniel Fast. I heard gospel singers Mary Mary talk about the fast on television earlier this year and didn’t think anything of it. Then while on facebook, a friend mentioned that he was getting ready to fast for ten days, and another friend responded to his message with scripture from Daniel. At the time I was going through some things that I didn’t quite understand and knew I needed God’s guidance. I prayed, but I wasn’t hearing from God. After reading the scripture, I decided to begin the next day with a 10 day vegetable, fruit and water fast. On my seventh or eighth day I decided to increase to the 21 days. It hasn’t been easy; but I feel so blessed! God is teaching me patience and persistence. And I know that at the end of this fast, He is going to tell me which way to move next. God Bless you Susan, and everyone reading this message! wow, i didnt know so many people do the daniel fast for lent. i found out about it from a girl in christen club at school. thats soo cool. i started my fast on the first sunday of march, because thats when i thought lent started. i will finish on easter sunday. i lost so much weight. i had a size 10 dress i was trying to fit for 2yrs and it took only a month to fit it. i was a size 14. and its loose on me. i had pain on my leg i prayed asking god to remove it and he did. god is soo good. he has been so good to me. thats why i am doing this fast for him. i have a question. i was told after the fast is over do not rush and eat solid food because my body would have to adjust first. to start off with light food such as soup. or else i will have stomach pain. is that true? Thank you so much for your kind words. My prayer for you as I type this message is that you will grow in the love and knowledge of our Amazing Lord as you seek His face during the Daniel Fast. He is so good! Expect God’s blessing in all you do! I praise God for leading me to your website, Susan. Although I’ve fasted several times before, this is my first Daniel Fast. I look forward to growing closer in my relationship with our Precious Lord and Savior, Jesus Christ. 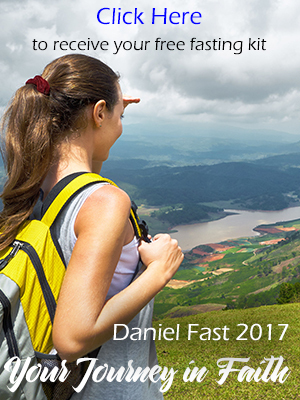 The Daniel Fast is anchored by two fasting experiences of the prophet (see Daniel 1 and 10) and by typical Jewish fasting principles. From these references, the Daniel Fast is a plant-based eating plan with water being our only beverage. So fish would not be part of the Daniel Fast. Now, I do encourage individuals with special needs to add fish and/or chicken if they need extra protein in the diet during the Daniel Fast. This would include pregnant or nursing mothers, athletes, teens and those with health issues such as diabetes. For the rest of us . . . only plant-based foods so fish would be out. My suggestion to you is to pray about this situation in your life and ask the Holy Spirit to direct you. If you then decide to forgo fish for the remainder of the Daniel Fast, then that would be good. You don’t need to start over or feel like you have not been fasting since you were not aware that fish is not part of the Daniel Fast. I began doing the Daniel Fast 10 days ago, but as I was reading some of the comments I was aware that fish is not allowed, Is this correct? A freind of mine mentioned to me that fish is okay to substitute for meats, and since it’s my first time ever fasting. My prayer for you is that you grow in the love and knowledge of our Amazing Father. He promises to lead us and direct us. So ask Him what you need. Ask the Holy Spirit to help you hear from God and to teach you to have spiritual ears. And you might want to pick up a couple books or study series about hearing from God. The Lord rewards those who diligently seek Him! Be blessed as you seek the Lord. Today is my 28th day of my fast. It will end on Easter Sunday. It has not been easy. The only eating veggies and drinking water is easy, the wanting of different foods is hard. I believe God is teaching me self-control. I have several big decisions coming up in my life and have no idea what God wants me to do. Doing the Daniel Fast has been rewarding so far (17 lbs lighter) and this is something I will do again. I started the Daniel Fast on Ash Wednesday Feb 25, 2009. Today is my 8th day. I feel better than great! I feel alive and happy again! For the first few days I had a slight headache and slight back pain but not any more. I plan to continue the fast until Easter Sunday April 12, 2009. Thank you and God Bless! Day 8 of fast ! God is good!